2013 was generally a good year for the markets (and underwriters!). The S&P 500 is up 26% on this time last year, with the NASDAQ composite running slightly higher at 30% - but not even close to the stellar 56% performance of the Biotech Index (fig 1). In fact, few events in other industries could compete with the Great Biotech IPO Fever of 2013, when the IPO conveyor belt went full overdrive, churning out an average of four biotechs a month into the public domain. An awesome $3.5 billion was raised in 46 NASDAQ biotech IPOs this year (not even including the monster $1 billion IPO of the global CRO Quintiles, or companies which have gone public on other exchanges) – second only to the historic year 2000, when altogether 63 biopharmaceutical players floated, raising nearly $6 billion. Table 1 has a list of this year’s 46 biopharmaceutical IPOs – the last one of which, TetraLogic, began trading just 20 hours ago (on Dec. 12th). Judging by the performance of the biotech IPO class of ’13, the markets didn’t seem to mind the craze at all. In contrast with last year, when the opening share price median was 20% below anticipated target range, the vast majority of ’13’s IPOs opened above IPO offer price (despite several necessary revisions), and as of December 11 are performing at an average of +46% on IPO price, and at +32% (mean) and +3% (median) since their share price on the first day of trading. For some companies, dreams of public markets did not materialize this year. Some companies have postponed going public as the markets no longer seem favorable this year, whilst others have withdrawn IPO filings altogether. Table 2 has queued, postponed and withdrawn IPOs. PhII and PhIII products constituted an equally shared majority of this year’s IPOs’ products (fig. 1), as one of the Phase III products already failed in clinical trials (Prosensa’s disapersen). 9 of the leads in 2013 were already marketed products, and one somewhere in between—the yet-unapproved Omthera’s (now AstraZeneca) Epanova is anticipating an FDA verdict on May 5th. There were no pre-clinical lead players in the 2013 IPO frenzy, unlike the two – Verastem and Regulus—seen in 2012. 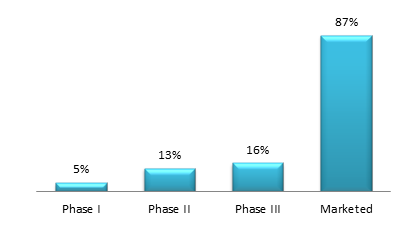 However, the non-negligible portion of 5 Phase I leads appears to show that going public for earlier-stage companies is certainly trending, although not excelling – see below. As one would expect, market interest is very visibly deterred by perceived clinical development risk. Development stage is directly proportional to the performance of the company’s stock post-IPO, and 2013 was no exception (Fig. 2). 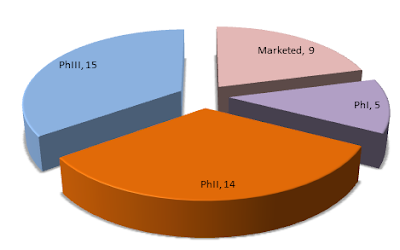 Companies with leads in PhI have performed at an average of just +5% since opening day, whilst marketed products in contrast performed at t 87% - thanks to some major stars like Insys and GW Pharmaceuticals. 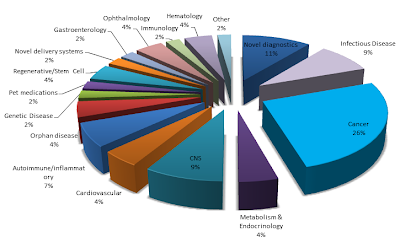 The most popular therapeutic area of leads whose companies went public in 2013 was, by a large margin, cancer – no surprises there (fig. 3). The popularity of this therapeutic area resonates in other 2013 pharma activities, such as Mergers and Acquisitions and Drug Approvals. With a higher chance of success, CNS would have long been the therapeutic area of choice, but pharma and biotech are seemingly shying away as chances to trial success are now extremely low (with the exception of pain). A novel therapeutic area in this year’s IPO landscape was pet therapeutics (which will probably be gaining popularity in the near future). Meanwhile, ophthalmology is a quickly expanding therapeutic field, mainly aimed at eye disorders in the growing elderly population. So far, hematology, CNS and pet medicine players are the best performers of this year’s IPO cycle. The worst performers are orphan and genetic diseases, with a -44% average since first trade. Novel diagnostic tools took second place in this year’s therapeutic area popularity rankings, comprising 11% of 2013 IPO leads. Biomarkers and novel indicators of hard-to-detect disease, or disease which needs to be detected in its early stages, such as Alzheimer’s, are a quickly emerging trend – not just for diagnostic purposes in hospital settings, but as useful tools which would help companies better define concrete endpoints in clinical trials. Many failed CNS drugs of recent years, for instance, have failed to demonstrate efficacy based on endpoints which many have deemed far too ambiguous (cognitive improvement based on verbal memory/performance tests, etc). In fact, it is likely that the massive potential of CNS will only explored again when better metabolic and/or genomic markers are present – firstly, to signal the presence of disease decades before it manifests, and secondly, to eradicate the destructive ambiguity of questionnaire-type clinical trial design. Some of the brightest stars in this year’s IPO group were perhaps unexpected, particularly because two of them – Alcobra Pharma and GW Phrarmaceuticals are foreigners, hailing from Israel and the UK, respectively. Rather suspiciously, the markets were particularly interested in the “weed experts” Insys Therapeutics (INSY) and GW Pharmaceuticals (GWPH), which specialize in opioid and cannabinoid marijuana-derived therapeutics for cancer pain and nausea management. Unlike the majority of IPOs this year, both companies already had products on the market prior to IPO. Insys has had everyone talking with a 564% surge in just 5 months, from an opening price of $8.50 on May 2nd all the way up to $53.64 in October. GW Pharmceuticals is up 264% since its debut in May, having hit a peak performance of 338% in November. Two more opioid developers are due to join GW and Insys soon: Cara Therapeutics and the Danish Egalet have both filed for IPOs in Nov/Dec. Update: On Dec 13th Insys Therapeutics received a subpoena from the Office of Inspector General of the Department of Health and Human Services in connection with an investigation of potential violations involving Health and Human Services programs. Insys stock plunged by 22% intra-day. Another rising star is Aratana Therapeutics (PETX) – one of the first ever developers of specialty medicines for pets (primarily cats and dogs). Aratana’s $6 IPO share price was below its expected $11-13 range, as the company’s unfamiliar business model may have caught some investors off guard. Having conveyed the massive, untapped and much-too-long ignored potential of the pet market, the PETX share price has now been steadily climbing, currently up 129% since it started trading. Despite the fact that pet owners spent $53 billion in 2012 on their animal companions (according to Aratana’s website), pet drugs are still mostly dose-adjusted drugs prescribed for humans. Aratana’s business model is centered around licensing drugs proved effective in animals and humans, and commercializing them through the FDA's Center for Veterinary Medicine (CVM). The cost of licensing Aratana pays is low in comparison to potential returns, and CVM regulatory pathways are obviously less stringent than pathways regulating human drugs. Aratana is currently advancing three pet drugs through their pipeline, and it shares soared on October 14 when the company announced its intention to acquire Vet Therapeutics, Inc.
Entanta Pharma (ENTA) is another starlet worth watching – the company is now at +111% on its first-trading-day price as its Hepatitis C drug ABT-450, co-developed with AbbVie, and is getting encouragingly close to the market following some great results of its Phase III Sapphire-II trial. ABT-450 is part of an antiviral cocktail shown effective in treating an amazing 96% of the most common genotype 1 HepC sufferers who have not responded to older treatments. Enanta’s drug is seen as one of the most threatening contenders to the throne of new, safer and more effective HepC medications – a throne currently being conquered by Gilead with Sovaldi, approved just last Friday (December 6th). Like Sovaldi, ABT-450 received a Breakthrough Therapy Designation (BTD) from the FDA, which shortens development and paperwork times. ABT-450 is thus looking at a New Drug Application (NDA) in Q2 2014, and a Prescription Drug User Fee Act (PDUFA) date of 3-4 months later. Alcobra Pharma (ADHD), based in Israel, is the newest entrant to the Attention Deficit Hyperactivity Disorder (ADHD) scene, dominated by drugs like Ritalin, Concerta, Vyvanse and Strattera. Alcobra’s lead compound, MG01CI, is an extended-release version of metadoxine – a hepatoprotective drug which has been on the market for nearly 30 years for the treatment of acute alcohol intoxication, alcoholism and alcoholism-related fatty liver. Although MG01Cl is not a novel compound, it has a crucial advantage over its “black box warning competitors” in that it is not a neurostimulant based on methylphenidate or amphetamines. In addition, having been tried and tested for 30 years now, metadoxine has a significantly better side effect profile than other ADHD meds – an important factor for a medication intended to be taken daily for many years. An encouraging sign of buyout potential for Alcobra is the fact that New River Pharmaceuticals, the original developer of Vyvanse - now an $800-million-a-year modified version of Adderall, was bought by Shire in 2006 for $2.6 billion. New River was a company roughly comparable to Alcobra, and was acquired when Vyvanse was in Phase III clinical trials. Shire and New River were already in collaboration on the drug since Phase II. Update: On Dec. 18, 2013 U.S. Food & Drug Administration has granted "Orphan Drug" designation to Alcobra's metadoxine for the treatment of Fragile X Syndrome. The Dutch Prosensa (RNA), developing disapersen for the treatment of Duchenne’s muscular dystrophy in collaboration with GlaxoSmithKline, announced that the drug did not meet its primary endpoints in Phase III clinical trials, just two months after the company began trading. Prosensa’s share price tumbled on the news, and is currently hovering at -78% on first trading price. Several investors are holding on, as Prosensa has two more drugs in the pipeline, which are, however, based on the same RNA Exon-skipping idea as disapersen.